He was arrested during the weekend by the security operatives and was said to have been whisked away to Abuja. Peoples Democratic Party (PDP) has kicked against the arrest of Ben Bako, one of its campaign directors in Kaduna. The party also alleged that there were plans to arrest Senator Ahmed Makarfi, a PDP chieftain and former governor. Aside Makarfi, others on the list Sarki shared of those pencilled down for arrest are Alhaji Mukhtar Ramalan Yero, former Governor of Kaduna State; Chief Felix Hyat, Chairman of the state PDP; Alhaji Yahaya Yaro Makama, a former chairman and Ibrahim Wosono, the state secretary of the party. Bako is the Director of the Media Committee of the governorship candidate Isa Ashiru’s campaign organisation. Speaking with newsmen on Sunday, Comrade Danjuma Sarki, the Deputy Director, Ashiru Campaign Organisation, said Ahmadu Idris, the state Director of the Department of State Security Service (DSS), contacted Bako before the latter was arrested. He said: "As a law-abiding citizen with nothing to fear or hide, Mr. Bako dutifully honoured the invitation of the DSS after informing many members of the campaign team. We are very much aware that long before now, the ruling All Progressives Congress (APC) in Kaduna State, under the leadership of Governor Nasir el-Rufai, had penned down a long list of influential PDP members in the state for intimidation, arrest and detention over spurious charges a few days to the general elections. “The plan is to lock away 150 leaders of the PDP at the state and local government areas on trumped up charges of hate speech during campaign rallies. The intention is to send fear and weaken the spirit of the campaign or to stir crisis in the state. “But unknown to Governor el-Rufai and the DSS, the more he arrests us, the stronger the PDP gets. It is too late to reverse the determination of the traumatised people of Kaduna State. They have been fleeced by a narrow group of friends and family under a government of tyranny, propaganda, bigotry, disunity and backwardness." Speaking on the statement el-Rufai made recently, when he threatened that foreigners who interfere in the forthcoming elections would leave in "body bags", Sarki said: “If anyone deserves impeachment, arrest or arraignment for hate speech over the years, it has to be el-Rufai of Kaduna State. “Curiously the presidency came out in full support of that crude, barbaric bravado, which carries a costly diplomatic price, should any harm befall any international election observer in the course of their legitimate duty in Nigeria during the polls. "From el-Rufai’s call for violent assault to the three senators in the state; his denigrating reference to the Pope over his rejection by the electorate in Kaduna State, and his latest threat, he remains the greatest albatross to local and international peace in Nigeria today. Not Mr. Ben Bako of the PDP. “We are calling on our members and supporters to ensure that they come out in large numbers and vote. They must ensure that their votes are counted, recorded and securely moved to the next collation centre. On this, we are ready to use every legal means to protect our franchise. No amount of intimidation, threat, blackmail and illegal use of state force will deter us from this aspect. 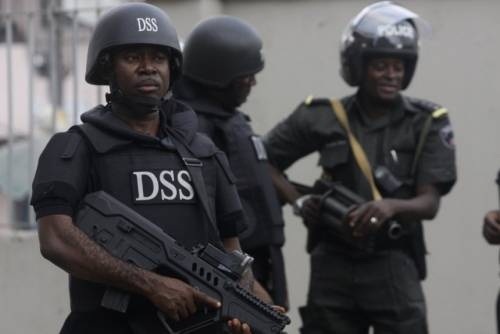 “The DSS has become compromised and partisan in Kaduna and we say no to such development. We believe that the Kaduna State Director of the DSS, Ahmadu Idris, will not be neutral in the 2019 elections and we call for his immediate redeployment. We also call on both local and international observers to take special interest in elections in Kaduna State elections."